In 1965, Skipper got a girlfriend named "Skooter" #1040. Skooter had the same body as Skipper (and Ricky) and she could wear Skipper's clothes. She was sold with a tan skin tone (pictured left) in 1965, and with the pink skin tone (pictured below) starting 1966. 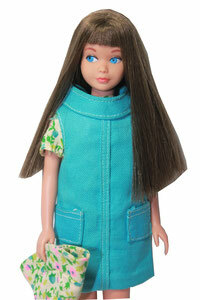 She also came with Skipper's basic hair colors "brunette", "blonde" and "redhead". She was sold until 1967. Markings: © 1963 Mattel, Inc. This doll was sold in her own box stating "Skipper's friend Skooter by Mattel" and was dressed in a two piece swimsuit and two red bows in her pigtails. She had her own "Skooter" wrist tag. The accessories in the box were the same as Skipper's. It's very hard to find Skooter dolls in a very good condition, with unfaded lips and no discolorations. Unlike Skipper's friend Ricky, Skooter didn't have her own wardrobe. However, there was one gift set for her, #1036 "Skooter with her Cut'n Button Costumes" from 1965 - 1967, which included a Skooter doll and some "sew free" fashions exclusive to this set. This gift set is hard to find. In 1966 and 1967 a bendable leg Skooter #1120 was sold (in a new box and with a different swimsuit). She was also available in a pink or tan skin tone. A pink skin BL Skooter is pictured further below. This doll was sold in Germany in 1971 and was called "Skooter with movable legs". She was pictured in this year's German Barbie booklet and was sold for 9,95 DM (approx. 11 US $).